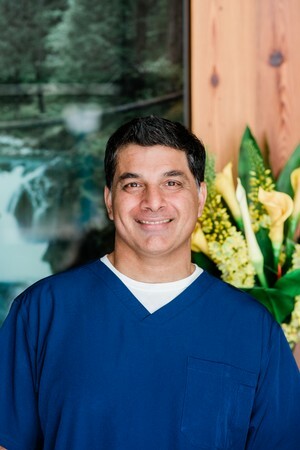 Dr. Parhar was born and raised in Nanaimo, B.C. He completed his undergraduate degree in Honors Biochemistry from UBC and went on to obtain his DMD from the UBC Faculty of Dentistry in 1997. After practicing general dentistry for 11 years, Dr.Parhar returned to UBC for the Graduate Endodontics program where he received his Diploma in Endodontics and Master's of Science degree. He is a member of the American Association of Endodontists, the Canadian Academy of Endodontics, the Academy for Sports Dentistry, the International Association of Dental Traumatology, and the Pierre Fauchaud Academy. Dr. Parhar is part of the medical staff for the Vancouver Canucks. He has also been on the medical staff of the Vancouver Giants Junior Hockey Club since 2001. He has been actively involved in various aspects of sports dentistry such as mouthguard programs, dental coverage for sporting events, and dental trauma management. He was the Co-manager of Dental Services for the VANOC Medical Services during the 2010 Vancouver Winter Olympic games. In 2011, he was awarded with a Merit Award from the British Columbia Dental Association for his contribution to sports dentistry. He lectures regularly on dental trauma and still contributes to the International Olympic Committee dental program to help improve the dental services for athletes during Olympic games. He also teaches at the graduate programs at the UBC Faculty of Dentistry. Dr. Parhar lives in Port Moody and keeps busy trying to keep up with his 4 beautiful daughters! He loves spending time at Rocky Point, Old Orchard Park and Barnett Marine Park. Dr. Parhar enjoys snowboarding, travelling, cooking, and staying active so that he can keep up with his daughters! Dr. Parhar has worked at various sporting events providing dental coverage over the years. He was director of dental services at the World Junior Hockey Championships in 2006 and the Memorial Cup in 2007. During the Vancouver 2010 Olympics he was able to help provide dental care to numerous athletes, as well as coordinating a mouthguard program.